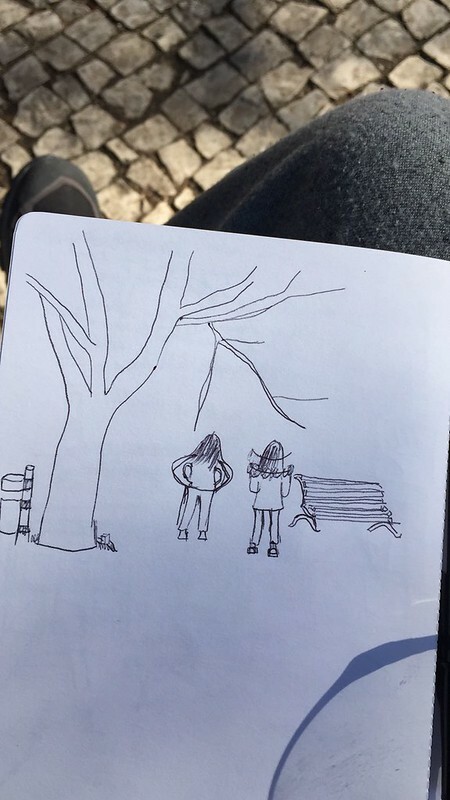 I had no mobile phone with me, nor any form of camera to take the beautiful scene so I decided to draw in my notebook. When I saw that what I had made was good, — able to remind me of how it felt when I saw it, I realised that I can do this again, when the time comes that it is necessary for pen and paper to meet. I had kept drawing ever since. It has not been long, just a few weeks. But I enjoy it thoroughly, I enjoy everything. Thus, I tend to draw everything — Of things, coisas.. que são meravilhosas para mim. O Senhor no cafe ao lado do escritorio, the Senhor in the cafe next to the office, the man who sat across me from the cafe last weekend, the people at the park, my bike ride home, the beautiful lady across street. And then this, two friends looking for a spot to take a selfie in the park next to my house. I remember drawing these lines and being so proud of them. So much so that I sent it to Krish who was half way around the world— being very proud of myself. I had finished this drawing the same night. Feeling rather good about it. Feeling so proud that I stared at the drawing for hours and celebrated by myself “I can’t believe I did it!” — I kept thinking. But the great thing was, that I felt as proud of the finished drawing, as I were of the initial stages — the first few lines, the mistaken line for the hoodie, the strange legs, the falling branches. I wish I were this happy about all the things I do, this total abandon, or rather, enjoyment of the act of doing. In these imperfect drawings, I have encountered that it is possible, to love just doing. That’s it. To be in the act of doing something, and knowing that you have arrived. This is it, the first line on the page is it. This is the place. And no matter how many more lines arrive, and reach their destined connections, it all matters, because I’ve done, it, I’m doing it, this is it, we have arrived.